I’m alive. I can hear you. Touch me if you believe me. My answer to the question “Can current sustainability problems be solved through more intelligent application of conventional modern ideas about humans, the natural world, and the relationship between them, or are fundamental changes to prevailing basic assumptions and attitudes required?” takes the form of a site-specific art installation. The piece, entitled Touch Me If You Believe Me attempts to engage passers-by in a conversation with nature. It is my contention that a root cause of our sustainability challenges is our alienation from nature. This separation allows us to make trade-offs between, for example, the economy and the environment, without realizing that without the environment there can be no economy. My project aims to break down that barrier predominant view and ask people to think about what communication with nature means and to consider that, if we are communicating, then nature must have a position to respect. Robinson and others’ work on the relationship between dialogue and sustainability has supported my long-standing interest in the power of dialogue (Robinson, 2004). Cronon’s suggestion that the “nonhuman world can communicate” (1995:200) provided the inspiration for the idea of a dialogue with nature. Important to note is the normative value of dialogue rather than nature or the trees specifically. The goal is not to convince people that why trees are good or promote the idea of ecosystem services. The ecosystem services model reinforces the fundamental axiom that everything has a monetary value and entities with a higher monetary value carry a higher moral value. My goal is to use the device of dialogue with nature to set up a questioning of our relationship with nature and what we truly value. 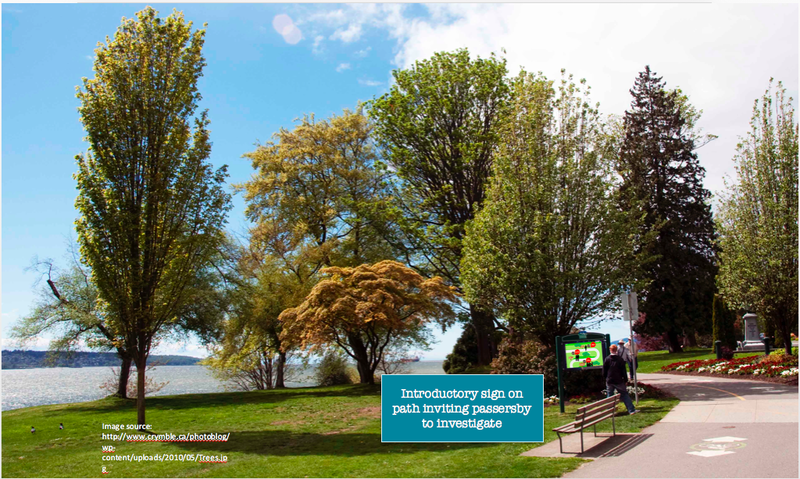 The core of the installation is a series of interactive wrappers around trees along the path at English Bay Beach in Vancouver. The wrappers say “I am alive. I can hear you. Touch me if you believe me”. 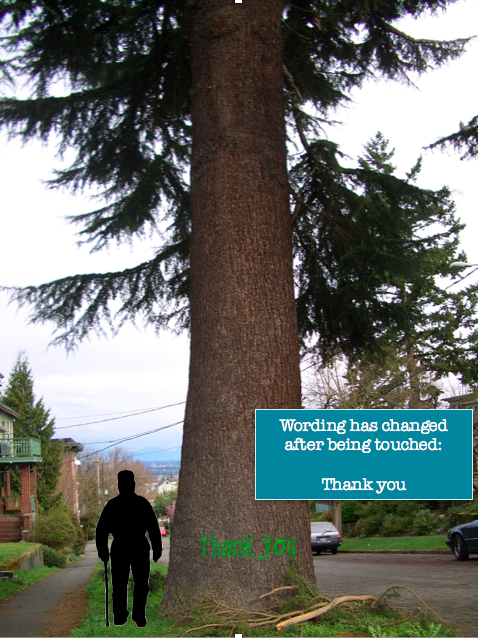 When someone walking by stops to touch the tree, the colour of the lettering changes from white to green and says “Thank you” providing visual feedback that the tree has heard the response. At the same time, a billboard on the other side of the path updates. The billboard shows statistics such as the total number of people that walked by, the number of people that stopped, and the number of people that touched the tree. To supply this data, motion sensors are mounted on either side of the path, on both ends of the installation. These sensors capture the pedestrian traffic flow. The wrappers on the trees send wireless signals to the server that powers the billboard. 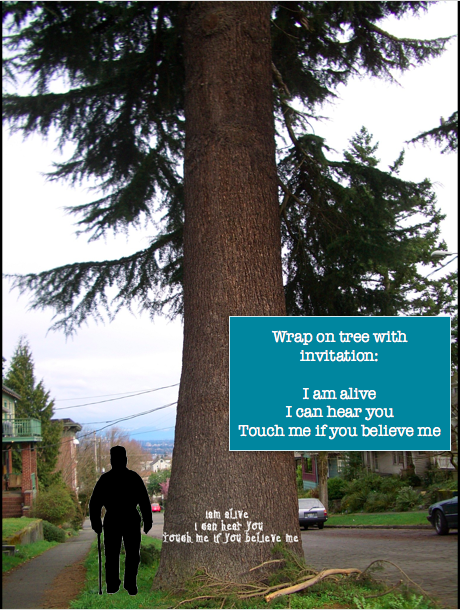 The irony of using high-tech tools to promote a conversation with nature will likely not be lost on participants. The conversation facilitated by this project is a necessary component in the fundamental changes due to our alienation from nature that I believe are required to address our sustainability challenges. My project seeks to address this problem in two ways. First by facilitating the conversation itself. For there to be a conversation, there needs to be at least two parties. By setting up a conversation in this format, I bring forward the idea that nature can be another party, we are not the sole occupants of the planet. The second approach is through the phrase “Do you believe me?” This invites participants to question what it is they believe. Even if they do not engage with the project, they are led to answer the question. Whether the answer is affirmative or negative, a questioning of axiomatic beliefs – the “conventional modern ideas” of our question – is taking place. Ben Kadel (2014). Personal Communication. Cronon, W. (1995). The Trouble With Wilderness; or Getting Back to the Wrong Nature”, in Cronon, W. ed. Uncommon Ground: Rethinking the Human Place in Nature. New York: W.W. Norton & Co. 69-90. Robinson, J. (2004). Squaring the circle? Some thoughts on the idea of sustainable development. Ecological economics, 48(4), 369-384.